Instagram’s ‘shoppability’ issue has been causing headaches for ecommerce marketers since the beginning of, well, Instagram; the inability to directly link images on the network to a corresponding page on a retailer’s site representing a huge barrier between content and commerce. The result? Hacks and workarounds on the part of the retailer (see our blog post on the topic for some examples), and an altogether pretty disjointed experience for consumers. But that’s all about to change. NB. To stay up-to-date on Instagram's latest marketing news, follow its business blog here. Has a Shoppable Instagram Finally Arrived? 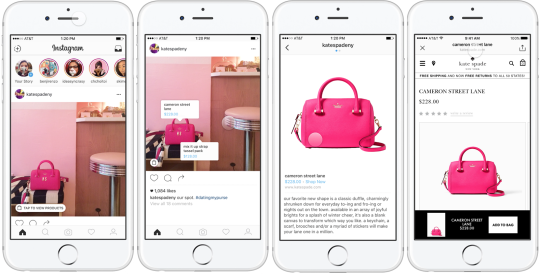 In a blog post on Monday, Instagram announced it is testing new shopping features with a select group of iOS users in US, in conjunction with a handful of brands including Kate Spade, Warby Parker, Hollister and J.Crew. While initially the features (which we’ll explain in detail below) focus on making it easier to shop the products featured in Instagram posts, the social network has hinted that it will be exploring ‘product recommendations, ways products are showcased to shoppers, global expansion and the ability to save content so Instagrammers can take an action later’ further down the line. Exciting times. How Will It Work for Consumers? For consumers, this move promises a far slicker shopping experience than what’s currently on offer - no more clumsy ‘see link in bio’ captions, tagging items with a product code, or clunky third party landing page hacks. So what does Instagram’s shoppable future look like? ‘Each post will have a tap to view icon at the bottom left of a photo. When tapped, a tag will appear on various products in the post—showcasing up to five products and their prices. Once a tag is selected a new detailed view of the product will open. This functionality will bring important product information to the consumer earlier in the journey, all without having to leave the Instagram app to search. 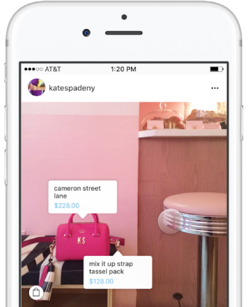 Kate Spade from Instagram for Business on Vimeo. How Will It Work for Retailers? The ability to add direct links - in the form of ‘Shop now’ calls to action - to sponsored posts has been knocking about since 2015, but it appears this new feature (designed for organic, non-paid posts) will not require retailers to allocate ad or affiliate budget to the channel. As reported by TechCrunch, Instagram won’t be taking a cut of purchases that originate in the app; it ‘instead plans to monetize the product by later allowing brands to pay to show their shoppable photos to people who don’t follow them’. There’s no word on when, or indeed if, this functionality will be rolled out to everyone, but Instagram’s announcement is a clear signal it means business when it comes to ecommerce, so watch this space.